I've been wanting to make an advent calendar for quite some time. The Fun 'n' Flair's DT challenge this week was for us to make an advent calendar. I am using Miss Shayla at Christmas Time. It is the perfect stamp for me to use for my project. I stamped the Christmas stocking on a variety of patterned paper and cut it out. I then pieced the stockings together. The numbers were all stamped onto the cuffs. I added some flowers and flourishes to the bottom corner. The Merry Christmas sign was cut out using Nestabilities dies. I then stamped the Christmas tree and adhered it onto the flower. This has been such a fun project and I am so happy that I finally have an advent calendar to use for Christmas this year. Here's a close-up of the stockings and flowers. Check out the Fun 'n' Flair blog to enter the sketch challenge to win this beautiful Miss Shayla at Christmas Time set. Sketch challenge ends this Friday. Check out more fabulous DT inspirations at the Fun 'n' Flair blog. That is a fantastic project, thank you for joining us at Sweet Stampin'. Lovely Christmas project. Thank you for joining us at Come and Get it this week. Love your advent calendar! 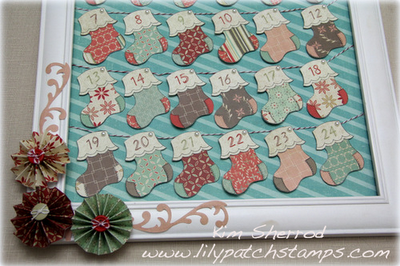 The stocking are adorable as well as the rosettes that adorn the calendar! Love your mix and match paper stockings - what a beautiful advent project. Thanks for sharing it with us at Fussy and Fancy! I love your project! That must have taken a lot of time to paper piece all of those little pieces. You did a fantastic job! Wow! Very pretty advent calendar. I can't wait to see the next stamp set from Fun -n Flair. Thanks for posting at Peachy Keen Stamps Anything Goes Challenge this week. What a gorgeous stocking advent calendar!!!! Thanks for joining us at FOSTV this week! Wow! Super project. You did a wonderful job on it. Thanks for joining in our anything goes challenge at One Stop Craft Challenge. What a great project is your Advent calendar! Thanks for joining us at FOSTV. This turned out super cute! I love how you used the stockings, they work so well for this project. Great job! so very cute !!! love the stockings hung on the twine, cute cute !!! Thanks so much for participating in the Peachy Keen challenge this week!!! What a stunning card. So lovely design. I like the colors and love the CAS style design like Plastic card which make the card POP. Thanks for sharing.